Dundee City Council’s aim is to help keep its roads and footways as safe as possible. During winter months we constantly monitor weather conditions and forecasts using modern Ice Prediction and Thermal Mapping Systems. Gritting and ploughing vehicles are on standby to act when required. Roads Winter Maintenance in Dundee applies to both trunk roads and council roads and footways. Dundee City Council’s adopted carriageways and footways are categorised into priority and secondary routes and are covered for winter maintenance from late October to late March. In adverse conditions, priority carriageways and footways are treated seven days a week. There are approximately 550km of adopted roads and 900km of adopted footways throughout Dundee. Approximately £1.5m is spent each year dealing with winter conditions on these roads and footways. It is not possible to clear all the roads and footways instantaneously, particularly in snow conditions when the gritters and ploughs have to treat the same sections of roads and footways more than once. Over 750 grit bins are provided at locations such as steep gradients, bends, steps and adjacent to sheltered housing. Everyone can do their bit to help, particularly in snow conditions. Clearing footways around your own home and helping elderly or infirm neighbours will ensure that many footways will be safer and easier to use. If shovelling snow, think about where you are going to put it, so that it does not block people's paths, or simply shift the problem elsewhere. Make sure it will not cause problems when it melts. Piling snow over gullies or drains may stop melting snow from draining away and allow it to refreeze. The grit bins will be replenished with grit/salt during the winter for use by the public on a self-help basis but should not be used for treating private property. • This map shows carriageway and footway routes only. • Priority routes are principal roads and footways, main bus routes and other heavily trafficked routes. • Other routes will be treated after priority routes are completed in appropriate conditions. • This map shows the GPS trail from the carriageway gritters for the last 24 hours. • This information is indicative only and all treatments may not be shown. • Some areas treated fall out with the Dundee City Council boundaries however this is due to road constraints. • Only vehicles within Tayside Contracts Dundee fleet will be displayed. • A location record does not necessarily mean a road has been treated. 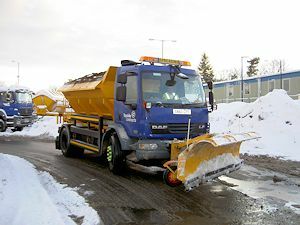 • Location of gritters should be used as a guide only, Dundee's cityscape can cause accuracy of GPS plotting to reduce.